When buying a new fabric, always think about what you would wear with this fabric, even only it’s faint idea at that point. If you have royal blue, electric green, hot pink and lipstick red in your stash only, then nothing actually can be worn together. The same goes for the type of fabric. You need shirting, but also need bottom weight to make skirt or pants. I know prints are easy to fall in love with. Fabrics with flowers, stripes, chevrons and polka dots are attractive. Hardly anyone would go oohs and ahhs on solid fabrics. But it’s very hard to pull off a chevron top with polka dot pants. If all your handmade garments are in fancy prints, then you will hardly be able to make an outfit. You do need garments in solid or neutral colors. Which piece of clothing do you reach out most often? That is your low-hanging fruit. Maybe it’s that cowl neck T shirt or that hoodie. Find a pattern that resembles the piece and sew up a couple. That is a good starting point to wear more handmade. Separates give you more options. With 3 tops and 3 bottoms, you could potentially have 9 outfits (if they go together), but 6 dresses are only 6 dresses. It’s just math. Wearing layers allows you to transition from one season to the next. It also gives you more look with the same pieces. For example, you can wear a cardigan over a tank top, or you can wear that same cardigan alone with a belt. If you live in a place where seasons are pronounced, then you are going to need different types of garments. Layers can only take you so far; you are going to need long sleeves, sweaters, jackets and coats. Some of you work 9 to 5 in the office, and some of you take care of the kids at home. You are going to need different clothing. I see many people spending exorbitant amount of time to make a “special” outfit that they have no occasion to wear. Don’t get me wrong; I would spend lots of time to sew my wedding dress, but not to sew an off-shoulder dress with fluffy gathered dress just because it’s cute. I hardly see anyone dress like that in real life. Make office-appropriate clothes if you spend time in the office; make exercise clothes if you need them every day; make casual clothes if that’s what you wear on a daily basis. It also helps to imagine whether you’d buy a garment in the store; I find that it puts my mind on a more logical level when making a decision whether to have such a piece of garment. The beauty of our bodies is that we are unique. After spending time to modify a pattern to fit our unique body, you may want to take advantage of the hard work and make another garment from the same pattern, and thus reducing the time to make a garment and increasing your throughput. Sometimes using a different fabric is enough to create a new look, but sometimes you might want to go for a little modification too. You don’t need have extensive knowledge about drafting. For example, you can add a seam in the bodice for color blocking, or make short sleeves out of a long sleeve pattern. The added benefit is that you know already that you like the style and fit of the pattern. If wearing all handmade is a little intimidating first, you can always create one piece to coordinate with your store-bought clothes. Don’t forge to look at your accessories too; think about the shoes, necklaces and scarves that you have. Sooner or later you are going to have enough to transition to all handmade. When I sew with a plan in mind (coordinates, colors, layers), I have more outfits to wear. It gives me a clearer picture of my wardrobe. Plus, it’s actually quite a lot of fun. Create a story board with pattern line drawings along with a swatch of fabric, you’d feel like a designer. Have no will power to stick with a sewing plan? Perhaps you should join an online sewing community. There are many sew along communities on Facebook (e.g. Sewalongs and Sewing Contest Facebook Group) that encourage you to sew together with others. That way you can find a few accountability partners in the group. Don’t forget that you can make accessories that change the look of your outfits. A collar, an infinity scarf or a cowl can make you feel like you are wearing something completely different. Even venture into making a bag or a statement necklace! If you always avoid sewing zipper or making buttonholes, you are going to miss out a lot of beautiful patterns and outfits. Always learn and expand your horizon, so nothing is going to fret you. You can create a beautiful wardrobe exactly the way you want it. What worked for you? 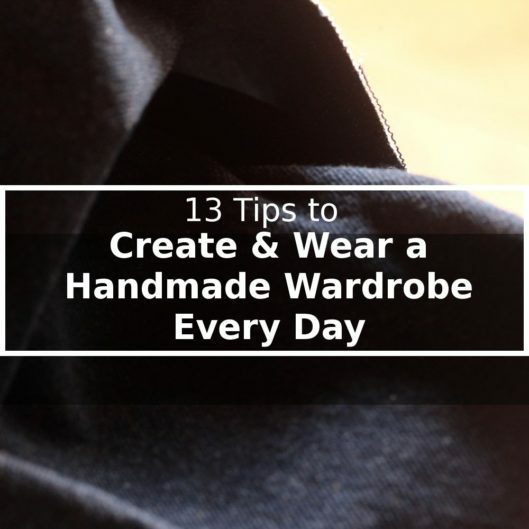 What tips do you have for creating and wearing a handmade wardrobe every day? All great tips. The one I need to keep doing is make some stuff in solids to go with everything. I also use catalogs and magazines for inspiration, I make loose copies of clothes I would buy. I love this – what great ideas!. #10 Stick with a Plan really hits home with me. I start out with a plan, but I’m easily distracted by new pattern releases! I’m also finding that I have a real need for tops in solid colors, too. Excellent advice and all things I try to do as I move to an all memade wardrobe. Almost all my clothes are handmade. i have a very special shape and I tend to think that I look better in carefully fitted clothes that are not too casual. I am 73 and have no job anymore. yet I try to dress a bit formal, but try to find styles in which I can easily rest and feel comfortable in the same time. Sewing is my hobby and so I sometimes make garments just to know how they are on my body and if I can manage to make them. Good list of things to think about. My advice to add to your list would be: buy good quality fabrics. Started two years ago when I decided not to buy any RTW anymore. My closet is a mix of 50% handmade and 50% RTW. Some great tips. Will try. Thanks! I’m the one that goes for all the pretty prints and then has nothing to wear with my clothes! I am getting better at that though, thanks to you and some of my sewing groups! Very helpful, since I am trying to sew more for myself instead of just the Granddaughters!